We fix iPhone, iPad, MacBook and other Laptop motherboards and logic boards. Has your iPhone or iPad been damaged because of inept technicians or because of liquid damage? Maybe a connector for the screen has been broken or smashed or an SMD Component on the board has been knocked loose. Your device may have had an unfortunate encounter with liquid or water and now all your precious data is locked inside the electronic brick. 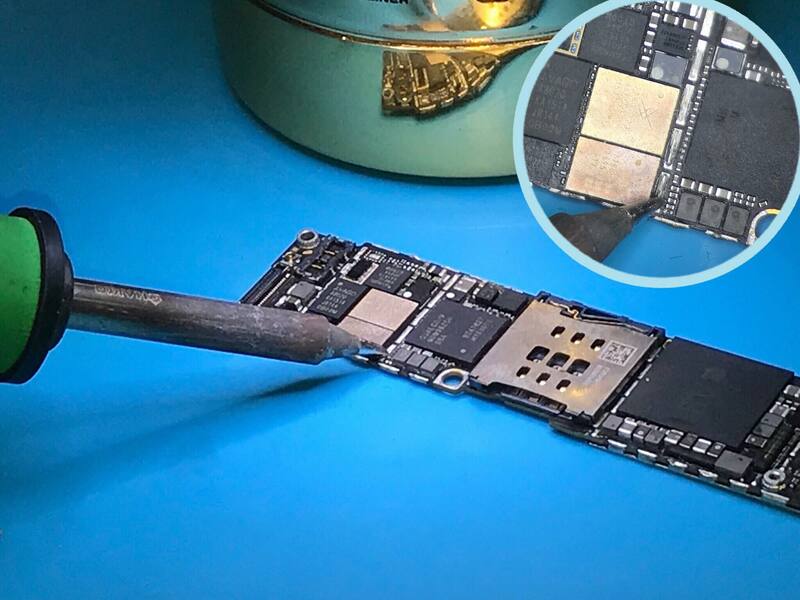 Have no fear, at Repairtech Rx we have the proper tools, knowledge and experience to repair iphone, ipad, macbook and other laptop motherboards, logic boards, flex cables and other components too small to work with just the naked eye. iPhone 5, iPhone 6, iPhone 6s, iPhone 7 not charging U2 repair due to use of a Non – Apple charging cable. The non standard cable fries the charging IC, commonly known as Tristar on the iPhone, iPad motherboard. The famous iPhone touch disease. iPhone 6 plus, iPhone 6 touch screen not working and the problem is not the screen. iPhone, iPad no power. Does your device show no signs of life when plugged in and itunes wont recognise it either? There is still hope, we may be able to repair and restore your device. iPhone 6, iPhone 6s, iPhone 7 no backlight repair. One of the more common repairs we see here at the shop is damage to the backlight circuit on iphones and ipads because of proper precautions not being taken before attempting screen repairs. Water or liquid damage to electronic devices. The best thing to do in such a scenario is to take the device in to a professional so that it can be disassembled and cleaned immediately. The longer the device sits after water damage the more it will corrode. We are your friendly neighborhood tech doctors and It is our goal to be an asset to the community, keeping that goal in mind we strive to create solutions where there were none before. We specialize in fixing Apple, Samsung, Blackberry, Sony, LG and other Android Phones, Apple iPads, Samsung tablets and computers. Cracked iPhone repair in sudbury fully fixed within the hour. The best parts ensures the best quality. 90 day warranty on all our repairs. Repair phones in Sudbury that have trouble charging or wont power on. Battery replacements available for all Apple iPhones and iPads. iPhone, iPad charging IC or commonly known as the U2 tristar chip replacement. iPhone iPad and MacBook backlight circuit repair. Micro-Soldering and PCB repairs for iPhone iPad and MacBook motherboards and logic boards. Data transfer your contacts and pictures from your iphone, iPad or Macbook to any device. Android and Samsung phones in Sudbury fully repaired within one hour. OEM parts and attention to detail ensures 100% quality. Glass only repairs available for certain devices. Factory built display assemblies with frames are used when available. Only the highest quality adhesives are used when necessary. Professional work performed by experienced technicians. Charging port replacement that requires microsoldering or a board level repair. Battery replacements available for all Samsung devices. Soldering and PCB repairs for motherboards, logic boards and flex cables. Blackberry Phone repair in Sudbury fully repaired within one hour. Battery replacements available for all Apple devices.